Britney Spears Circus Fantasy captures the magical atmosphere of the show. 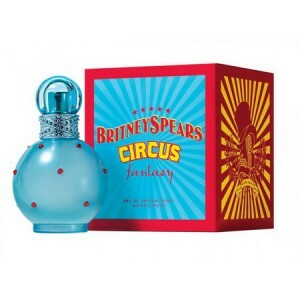 Britney Spears Circus Fantasy 100ml. Eau De Parfum arrived on the market in August 2009. The perfume was created in cooperation with Elizabeth Arden and it introduces notes of fruit, intoxicating flowers and creamy musk. Top notes incorporate juicy raspberry zest and apricot blossom. The heart adds blue peony along with lotus and orchid, while base notes include vanilla, musk and violet candy. The fragrance is available in a blue bottle shaped like its antecedents, Fantasy and Midnight Fantasy. The smell is a carousel of music, laughter, fireworks, gambling. Only smelling, forever immersed in the world of celebration and fun. Fragrance woven of drops relaxed and languid vanilla orchid, musk passionate and tender water lilies, violets are charming and sweet raspberry. Woody and sweet notes confusing way to the heart of cooking this way just for a true man. A flower apricot granules and peony are worthy presents conqueror. Luscious fruit, tempting florals and creamy musks capture the magical atmosphere of the show with a colorful illusion of fun, sexiness and glamour. The spectacle opens with juicy accords if sugar coated raspberry and apricot blossom, reminiscent of enticing candy. The magic continues as blue peony, waterlily and addictive red sweetheart orchid take the limelight with delicious sensations and exhilarating temptations. The grand finale is a captivating sense of seductive sensuality, blending sweet vanilla wood, creamy musk and violet candy.